I made Oreo Truffle Pops that are dipped in chocolate and covered with sprinkles for a celebration. Oh yeah, I know how to party! What is the occasion? One year ago today I published my first post here on WonkyWonderful. My little baby blog is turning one year old! One year ago, I had been battling a case of insomnia for several months. In those months I had spent my late nights learning how to crochet and I had also discovered the awesomeness of Pinterest. Before then I had absolutely no idea what a blog was. I thought blogs were online diaries that people used to share their feelings. It wasn’t until I realized that all of those amazing recipes, crafts and projects on Pinterest were created by bloggers! So on a whim I decided to start my own blog . . . and I haven’t had a full night’s sleep since! WonkyWonderful began as a craft, crochet and recipe blog. I soon realized that I am an extremely slow crocheter and well, I’m not very good at crafts. Luckily I also discovered my love for developing recipes, something that I had never before attempted. And as they say, the rest is history. I’ve met so many extraordinary people that share my passion for food and creativity. I appreciate all of you that have supported WonkyWonderful this past year either by commenting, following or just taking the time to read my posts. Thank You! Mostly, I am so very thankful that I had that extreme case of insomnia a little over a year ago. Who would’ve thought that a little insomnia would make such a big difference in my life!?! When I began to ponder what type of blogiversary treat I should make, the obvious option was a gorgeous triple layer cake that was dripping with decadent chocolate ganache. But, then I remembered that I am absolutely terrible at making cakes. I mean, they taste great but are UGLY! I don’t have the patience or the time to fuss with a cake for hours trying to make it purdy. So I decided to brainstorm ingredients. Besides cake what would I want to eat during my celebratory binge-fest? OREOS! I rarely buy Oreos because it is so easy to devour an entire package within a few days. I made these FlufferNutter Truffles a while back and had planned to eventually make another simple truffle. So I decided to make Oreo Truffles made with Birthday Cake Oreos, of course. And it ain’t a party without SPRINKLES! One last thing before we get to those super tasty Oreo Truffle Pops. Due to technical difficulties my last recipe post was never sent out to all of my email subscribers. Apparently the universe didn’t think that people were ready for my Chocolate Beet Cupcakes. So be sure to go check it out! I wouldn’t want anyone to miss out my Nutella Glazed Chocolate Beet Cupcakes! Blend an entire package of Oreos in food processor until it is powdered crumbs. Add the cream cheese and process until thoroughly blended. Shape into walnut sized balls and place on a parchment lined tray or baking sheet. 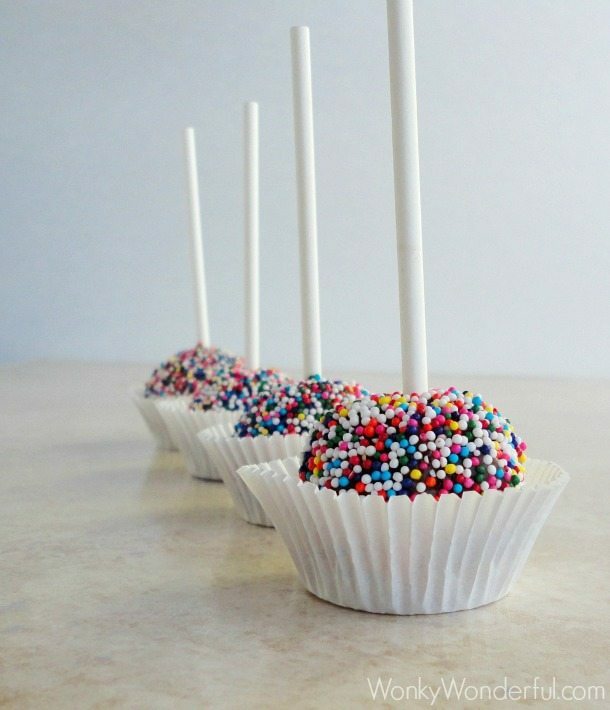 Insert the lollipop sticks into the tops of the truffle balls. Cool in the refrigerator for at least 30 minutes or until the truffle balls are firm. Combine chocolate morsels and coconut oil in a microwave safe bowl. Remove truffle balls from refrigerator. Pour nonpareil sprinkles into a bowl. Dip truffles into melted chocolate while using a small spoon to gently remove the excess chocolate. After dipping truffle in chocolate hold it over the nonpareil bowl and sprinkle on the nonpareils using your hands. Place dipped and sprinkled truffles back onto parchment and return to the refrigerator for another 30 minutes or until the chocolate has cooled. This recipe makes 22 Oreo Truffle Pops. Between you and Robert Redford I want an Oreo truffle now! Oh my those sound yummy! And HAPPY BLOGGY BIRTHDAY!!! Happy Blogiversary! I’m so happy to go through this crazy world of blogging with you and look forward to each one of your scrumptious posts! Keep up the great work Nicole! Thanks Tanya! I’m so happy to be able to chat with you about all of our blogging ups and downs. Happy blogiversary! 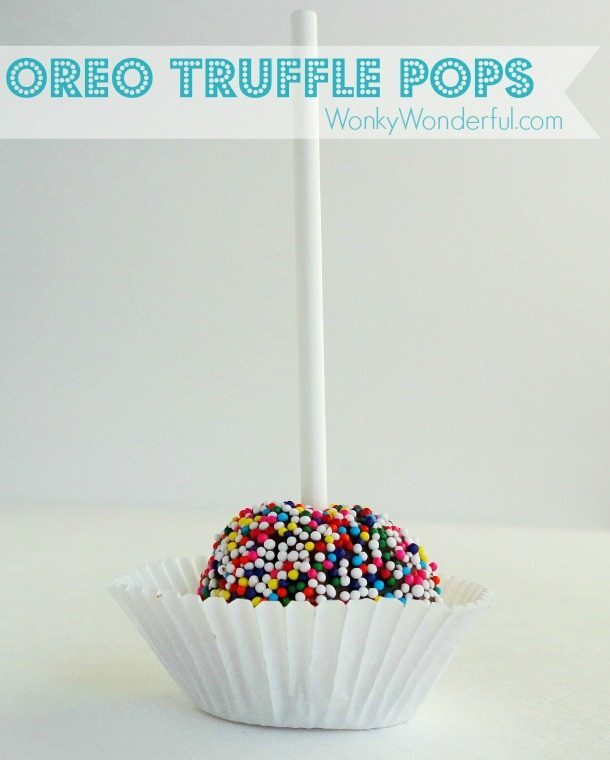 What a fun way to celebrate with Oreo truffles! Thanks Jessica! 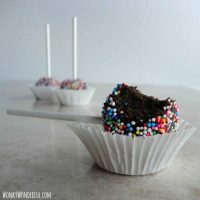 These are a really fun treat, the kiddos Loved them! Happy Anniversary! What lovely pictures…. I would love one right now! O.M.G. These are made of total WIN, Nicole! I know what you mean about Oreo Cookies – I could eat a ton of them if they were in front of me! I have to try to limit how many times I buy cookies and cream ice cream as well. It’s my favorite ice cream flavor and when it’s in my house, I have a bowl every day! 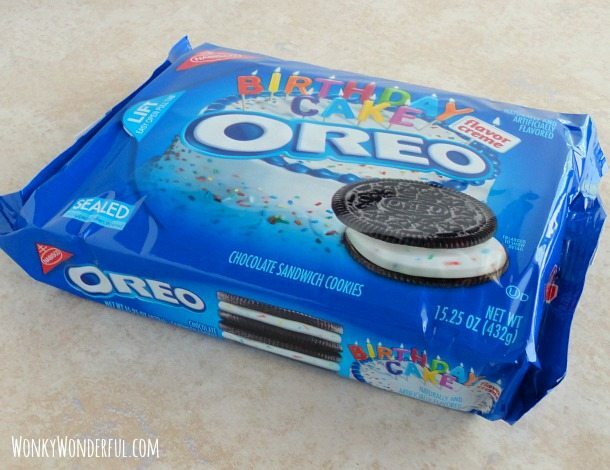 Yes, these are like eating Oreo Cookies x 100! So Flippin Good! My friend made me some of these, and they were sinfully decadent! ADORABLE! These would be perfect for my daughter’s birthday party. I hope your daughter loves them as much as mine did! Happy Blog Birthday! It’s so exciting 🙂 I love the sprinkles! Love them! I’ve pinned it! Thanks for sharing at Two Cup Tuesday at Pint Sized Baker. Thanks so much Karyn! … and I LOVE Sprinkles too!!! Nicole, I noticed these make 22 but you’ve taken a bite out of one, you can just send the remaining 21 to me! And I love the pretty colors of your non-pareils. Thanks for sharing at Thursday’s Treasures, I’m featuring you this week! do the truffles need to stay refrigerated since they have cream cheese in them? I was wondering why the coconut oil? I have seen several recipes, and yours is the only one that calls for it. I’m making the truffles in the shape of footballs for my son’s coaches, thus, they have to be perfect! Hi Leslie! I always add a little coconut oil when I am melting chocolate just to create an extra smooth consistency. You can omit the coconut oil if you prefer. Enjoy!